Belleek Celtic lace pitcher features both Trinity knots and shamrocks; it is made of fine china. The Celtic Lace Pitcher takes its inspiration from ancient Celtic design and the delicate handcraft of Irish lace-making, combining themes found in both styles add to its distinctive decorative appearance. This exquisite pitcher has been designed to be both practical and useful for everyday living. It is 6” tall, holds 20 fluid ounces and is microwave and dishwasher safe! It is a perfect addition to the Celtic Lace Bowl and Celtic Lace Mug which were introduced as Edition Pieces in 2012 and 2013. A hand painted shamrock is found under the handle on each piece. It has an exclusive trade stamp with the personalized signature of its designer – Marie McGrellis. The mold for this collectible and functional pitcher will be destroyed at year-end. The Celtic Lace Pitcher is the Belleek edition piece for 2014 and it features Trinity knots and shamrocks. 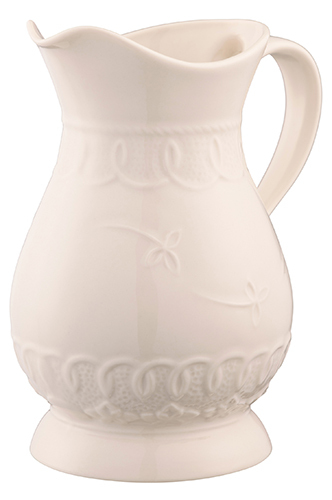 This Belleek pitcher measures 6" tall and hold 20 ounces. The Belleek Celtic lace pitcher is hand crafted in Belleek, Ireland and is gift boxed with Celtic knot and shamrock history cards, complements of The Irish Gift House.